Anticipating a trip to somewhere unknown to me is very exciting and keeps my mind open to new discoveries. Abu Dhabi did not disappoint. I stayed on Saadiyat Island just minutes away from the Abu Dhabi International Airport. The Island is set along the beautiful Arabian Gulf Coast with long stretches of white beach sands with a turquoise blue sea and sky to match. Dubbed as Dubai’s older, more sophisticated and cultured sister, Abu Dhabi is currently developing a heritage project, visualising culture through museums and art and establishing a high-end luxury experience for leisure and for visitors whilst maintaining natural habitats for local turtles. Making this the next sought-after destination. Saadiyat Island runs along the coast, only an hours drive West of Dubai. The landscape is home to Hawkesbill Turtles, currently in a protection scheme to keep them in their habitat. The natural surroundings, beach front and luxury living space has merged together beautifully at Rixos Saadiyat Island Hotel. Opulence, diamonds, and sparkle is in abundance throughout the Rixos Saadiyat, with a grand entrance of marble and crystal, and the most impressive interior design and architecture, from floor to ceiling. As you walk through there is a stunning colour palette of blue, green and gold that emerge from the neutral tones. An occasional flash of pink in accessories and seating areas add an element of fun. The sumptuous design of my deluxe room had an immediate impact. The hotel’s designers have created a sensational mix of emerald green marble walls and floors with gold finishings, which added to my already relaxed state of mind. The view from the balcony was of a most perfect sea and I was delighted to arrive to such a divine setting. A huge surprise for me was how well the Rixos Saadiyat catered for families. I am a mother of two, with an energetic 5 year old and a curious 10 month old so find myself looking, (often without meaning to) for facilities for children, and check the flow of the stay and how this would be good for me and my bunch. The all-inclusive experience means there is no messing around with room numbers and wallets. Instantly my load is lightened. Both the quality of the food and the selection was incredible. Whether you are pescatarian, vegan, want a light meal or go for a full 3 course breakfast, catering have thought of it all. I even tried a new fruit to my palette, a mangosteen, which was so juicy it literally burst in my mouth. Delightful. Dining at Rixos Saadiyat was another adventure with 5 restaurants to choose from, ranging from Japanese to Italian and traditional Turkish cuisine. It was hard to decide, but luckily it was all planned out for me so I just had to turn up. The quality of food blew me away and the hotel fully catered for my gluten free and vegan friends. The Italian restaurant at the hotel even brought out Chef to talk us through dishes and options, which really enriched the dining experience. A mega plus for Rixos Saadiyat is the children’s facilities on offer as they have their own water park with an exclusive wave machine next to it. This is not just your average a slide and an elephant in the water, but an entire water park. Big kids can play safely and little kids can paddle nicely. They also have a lovely children’s day centre filled with great playrooms and more importantly lovely staff. Now, if you are wise enough to make really good use of the children’s centre you will be wise enough to book a spa treatment whilst the kids are at play. A sanctuary for all who appreciate wellness and relaxation, the Turkish-inspired spa revels in a vast choice of luxurious treatments that are created to revitalise and balance the mind, body and spirit. The spa specialises in the traditional hammam treatment as well as offering manicures and pedicures, body wraps, exfoliation and facials. Available facilities include a steam room, a jacuzzi and a beauty salon but also a super special hot stone. Literally a large hot stone that you lie on and it gives a deep heat into your body. Heavenly. Rixos Saadiyat’s pool area is in prime position next to the beach. It boasts a large family pool, with a pool bar immersed in the water, just to give you the full holiday experience. The walk from hotel to beach is barely one minute and you are transported to a tranquil view of the Arabian Gulf. Paddle boards are available to take out to sea and the sun beds are all inclusive. It is little touches like this that makes it extra special. Dune bashing will be at the top of the list. I’d say this isn’t one for the kids and a little risky for those who get travel sick. But if you do manage to book an experience like this, taking a 4x4 into the dunes is extra special. For me, it wasn’t so much the thrill of driving over dunes that captured my attention but when we stopped to take in the view of the vast dunes that went for miles and miles into the distance. It gave me a real sense of perspective. I am so glad to have experienced this part of the world. 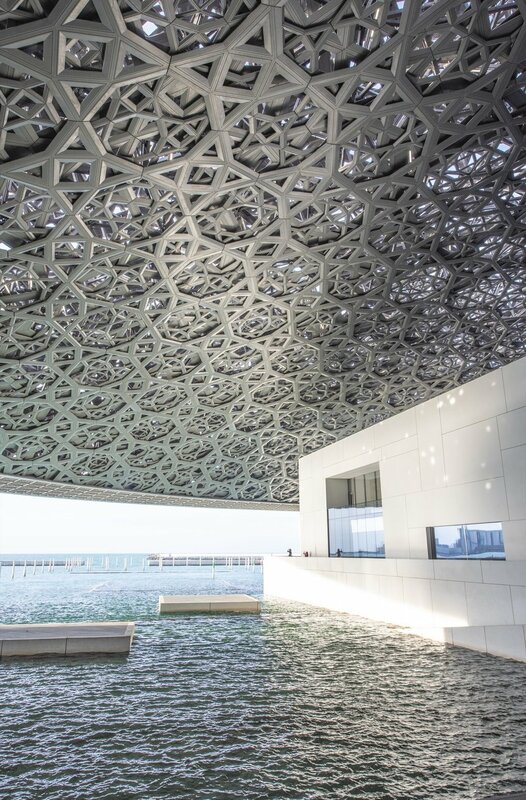 Another out of this world experience is the Louvre, Abu Dhabi. The museum hosts art history throughout the ages as well as a comprehensive contemporary art collection but the Louvre itself is an enormous piece of the Abu Dhabi show. A huge piece of beautiful architecture in a truly amazing setting. The Architect Jean Nouvel should be proud. The domed roof weighs 7,500 tonnes and was made from the same quantity of steel used to make the Eiffel Tower. The design of overlapping steel serves many purposes, one of which is to feature the ‘rain of light’; the holes let light into the structure creating a magical experience. The dome also acts as a microclimate canopy, as well as being of reflective material that helps to keep the building cool. Super clever and amazing to walk under. The building underneath this gargantuan design is created in more layers forming platforms and steps into the water. The picture will tell it all but it’s a must see during your stay. For me, the Shaikh Zayed Grand Mosque in Abu Dhabi at dusk was like something only seen in films. The largest mosque in the country, the Grand Mosque has perfectly made dome structures, nesting in the largest place of prayer I have ever been to. There is no holding back with the fantastical display of richness. The mosque is filled with huge chandeliers, 12 tonnes each, made with millions of Swarovksi crystals, and the walls are decorated with marble and mother of pearl. Visualising thousands of people in this space all at once was impossible. The place took my breath away and I left feeling I had experienced the unimaginable.